Growing up, Laura Brownfield remembers that her mother “was always so dynamic in her work with many charitable causes.” She joked with friends and family for years that her mother was a “professional volunteer” and when she grew up, she wanted her job. These days, Brownfield has transformed into a committed philanthropist and a prime example of someone all-in for philanthropy: Giving her time, talent, and treasure to support the causes she cares about most passionately. It’s no surprise that Brownfield was drawn to giving. Research by the Women’s Philanthropy Institute finds that the relationship between parents’ and adult daughters’ giving is stronger than that between parents and adult sons. Parental frequency of giving also matters more for daughters. She doesn’t do it alone, however. Philanthropy is a core tenet of her marriage with husband, Royce. While the Brownfields have been able to contribute more to the causes they care about since they created a donor-advised fund, it is not only about the money. They have contributed their time, their energy, their networks, their know-how, and new skills they picked up along the way to support the most vulnerable among us: Kids. As a former middle school art teacher, Laura’s focus area was a natural fit. If you are looking for more articles and resources for Women's Philanthropy, take a look at these Giving Compass selections related to impact giving and Women's Philanthropy. Our Women Give 2019 report found that generosity is a value shared by all communities, and that women across race and ethnicity are leading through philanthropy. Together with the YWCA and Facebook, we are proud to bring these findings to life by spotlighting the stories of real-world philanthropists—women who donate their time, treasure, talent, and testimony to make the world a better place. Watch the complete selection of #IAmAPhilanthropist videos at Women's Philanthropy Institute. The Brownfield’s philanthropy has often been informed by their community. With the full support of her husband, Brownfield has taken on the role of “doer” rather than a leader. Through her church, Brownfield was introduced to Pastor Surafel Gebretsadik, the founder and executive director of Hope 4 the Hopeless (H4H), an NGO that provides wrap-around services for abandoned and orphaned children in Ethiopia. Central to her involvement with the organization is that she trusted the people who were already involved with the NGO; members of her church had previously visited Ethiopia and saw the impact of the NGO’s efforts. Hope 4 the Hopeless is 100 percent volunteer-driven. Brownfield and her husband serve as sponsorship coordinators in association with the organization’s board of directors. 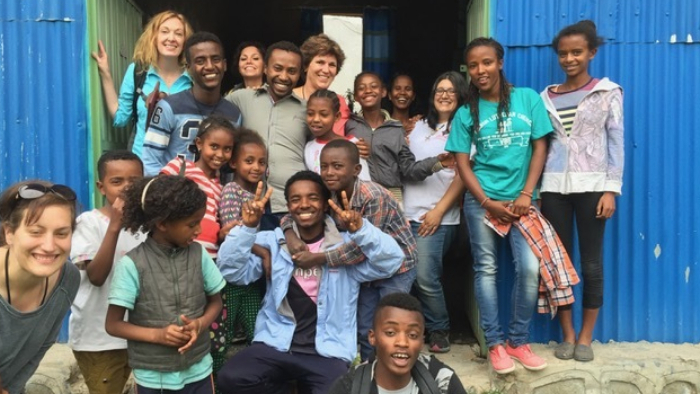 She co-led a mission trip to Ethiopia and saved the organization’s tax exempt status almost single-handedly. As the “doer” in the family, she maintains the H4H website, a new skill she learned to provide support. Brownfield’s other two causes are closer to home. Her husband was familiar with Mulligan’s Manor (yes, the mulligan that is a second chance in golf) in Maricopa County, AZ because of a work connection. This small nonprofit is a safe haven for LGBTQA youth in need of respectful housing. Brownfield says it’s amazing what “people with a lot of love and compassion can put together.” While neither Brownfield nor her husband serve on the organization’s board, she works hard to keep the pieces afloat for the Manor, the only nonprofit LGBTQA group foster home in the entire state of Arizona, by promoting the organization’s efforts on the website and in newsletters. Brownfield also assists with special events that support the youth and last year, she and her husband secured transportation that the house could use. Expanding her involvement with vulnerable children, Brownfield is also involved with Trinity Opportunity Alliance, a program created by the former pastor at her church. It provides opportunities for youth aging out of the foster care system to gain employment. More than 160 youth have become employed since the program started. Recently, with more time available in retirement, Brownfield has added bone marrow courier for the National Marrow Donor Program to her “doer” role. More than 300 volunteer couriers hand-carry lifesaving cells from donor to recipient. For Brownfield, this is especially joyful when delivering the cells to children’s hospitals. Her volunteer efforts illustrate research that shows women often support causes with which they have a personal connection. In this instance, her niece and a dear friend had received bone marrow transplants. Brownfield’s experiences with philanthropy dovetail with research that details how gender matters in philanthropy. In general, the research finds that women are more likely than men to give to causes that support youth and family services. Being on a board or volunteering for an organization motivates women more than men to give. Laura’s trust in those connected to Hope 4 the Hopeless is reflective of a strand of research that finds that women’s giving is often tied to their social networks (in this case the church) and trust in others. For the Brownfields, philanthropy is a joint effort even though she says he is the inspiration and she is the doer. They exemplify research that finds that the majority of households (50 percent in high net worth households and 75 percent in the general population) decide jointly on their charitable giving. This committed philanthropist is grateful for the opportunities she has to leverage all of her resources – her time, talent, treasure, energy, skill in navigating airports – to make the world a better place, especially for kids.